Now you may remember Jayne Barton Overett’s previous Neon Anglerfish party that I spoke about a little while ago, and if you do remember you will recall how fabulously unique and spirited it was. 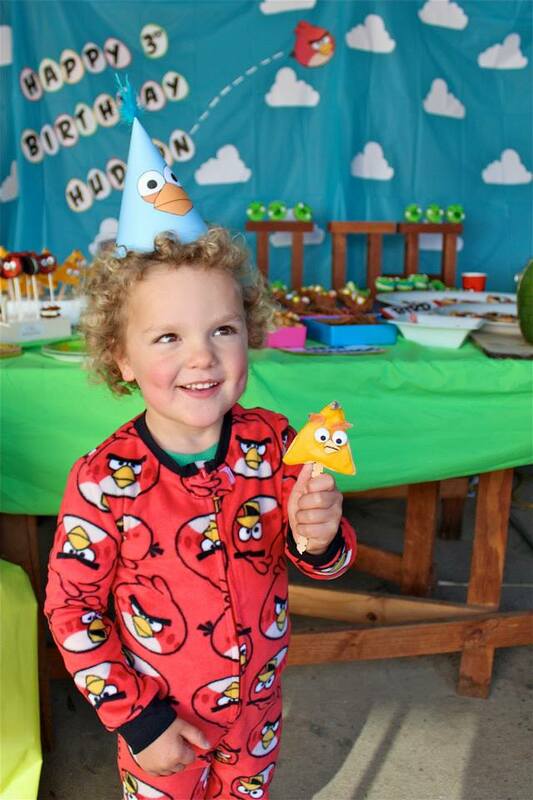 I wanted to continue shining a light on Jayne’s amazing birthday parties that she has been throwing for her children because the ideas behind them are so inspired, and the next one Jayne put together was an Angry Birds themed party for her son Hudson. Now, for those who don’t know what Angry Birds is, it is a game that is played on your phone, tablet, computer etc. where different styles of birds are catapulted into different levels and the aim of the game is to hit the bouncing green pigs that are sitting on each of the levels. The game is a fun game to play with many different levels, challenges and themes and it has become a very popular product and children’s party theme. 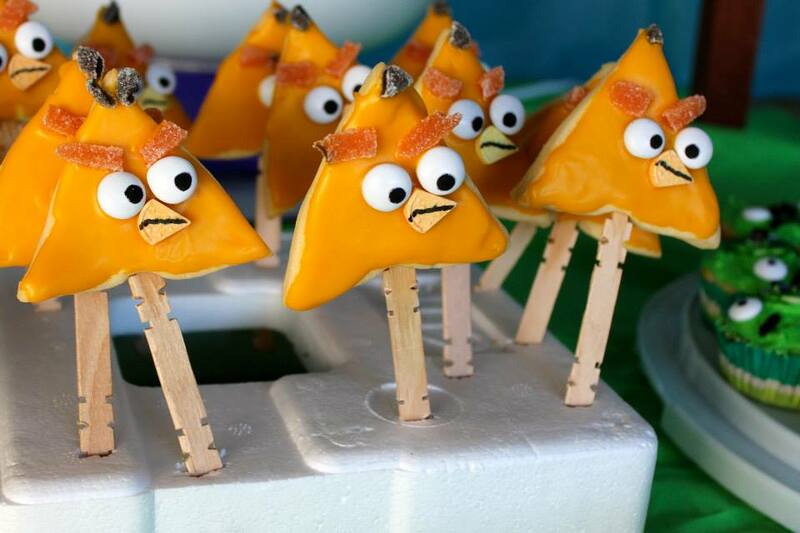 There is a lot of external inspiration around for an Angry Bird themed party so Jayne ran with the designs as opposed to buying the generalised licenced products which turned it into a fun DIY Event. The food for this Angry Birds party was absolutely steller and Jayne has told me that it was easy to put together because the birds and pigs used in the game are drawn so simply. Jayne featured the Yellow Bird as a cookie on a stick, which was made from triangle cookies baked onto a stick and then decorated with bright yellow icing, white mints with black food colouring as eyes and jelly lollies that made up the eyebrows, top feathers and beak. Jayne even used left over candy from a previous party just to show that recycling is super effective in a DIY party! Following on from the Yellow Bird cookies, Jayne also made a Red Bird Oreo on a stick. Placing the Oreo cookie on the stick (which is apparently quite hard to do!) the Oreo was then covered with red candy melt mixture on one side, which was then decorated with white mints and black food colouring as eyes, cut up liquorice for eyebrows and a cut up cornflake to create the beak! In these kind of cases, food colouring markers are your best friend so if you plan on doing something similar you should stock up! Just so there was a diverse range of characters featured at the party, Jayne also created Pig cupcakes which were the perfect medium to portray the rounded characters in the game. Vanilla cupcakes were decorated with bright green icing, a circle of fondant for the nose, white mints for eyes and black liquorice for the eyebrows, nostrils and eyes. 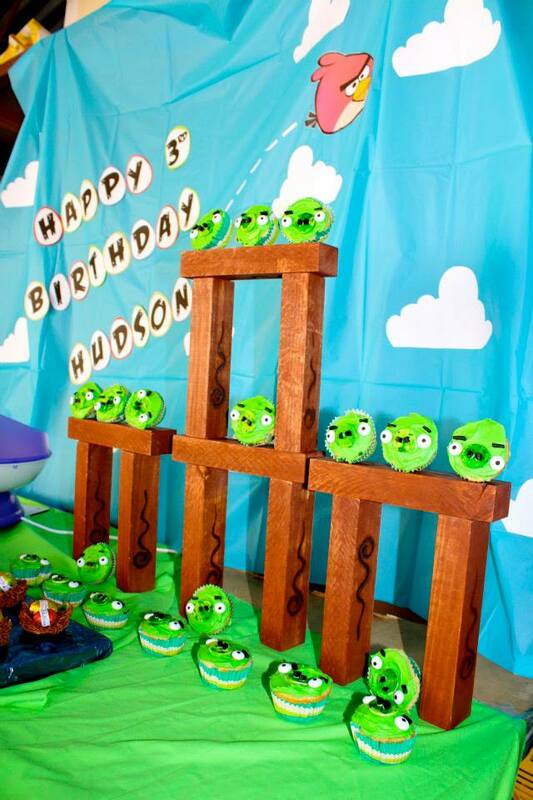 To round up the experience and turn into a decorational display as well as a fun treat, Jayne set up a giant Jenga block level in the style of the Angry Birds games and set them up on them. What a marvellous idea! To continue with the rest of the food in an Angry Birds theme, Jayne also served a Watermelon pig, which was a full watermelon that was cut into the shape of a pigs head with facial features attached. An Angry Birds pizza was also served with a pepperoni topping creating the Red Bird colouring and red capsicum and carrots used as a beak and eyes. What a delicious twist! 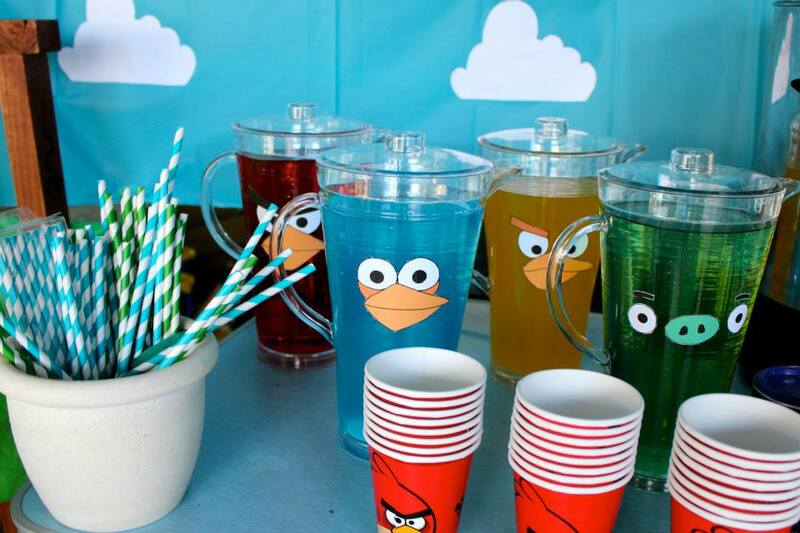 Not to be out done by food alone, the whole dessert table was themed Angry Birds with clear jugs of red, yellow, blue and green cordial filled and printable eyes and beaks stuck onto the jugs to create the animal effect – simple yet so effective. 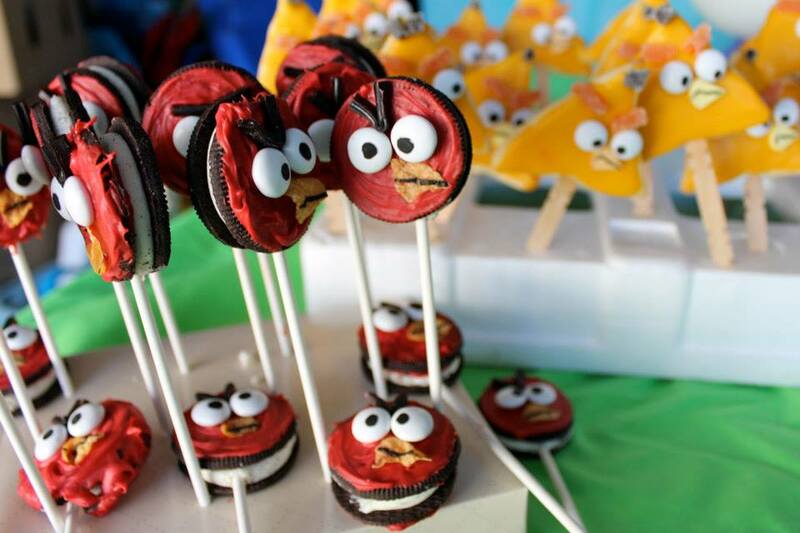 Now, it wouldn’t be an Angry Birds themed party without a few Angry Birds themed games. 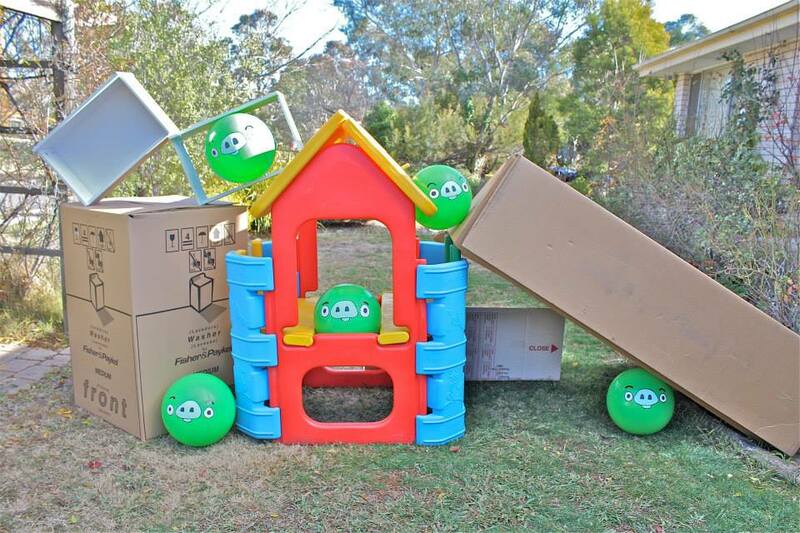 Jayne set up a few life size Angry Bird levels where she painted large green balls to look like the pigs in the game and used boxes and broken drawers to be the debris amongst the level. The kids took turns using a homemade slingshot and smaller similarly coloured Bird style balls to hit the pigs. Sounds like a great game to me! Jayne had also set up an inflatable pool with shredded paper to symbolise a birds nest, in which she hid creepy crawley toys within. The kids had to go through the paper and find the toys that were in the shape of things birds like to eat. It was a successful game, and with a messy pool of shredded paper you would be surprised if it wasn’t. Jayne also put together a game of skeeball using long pieces cardboard with the Angry Birds faces on them, which turned out to be a great success. 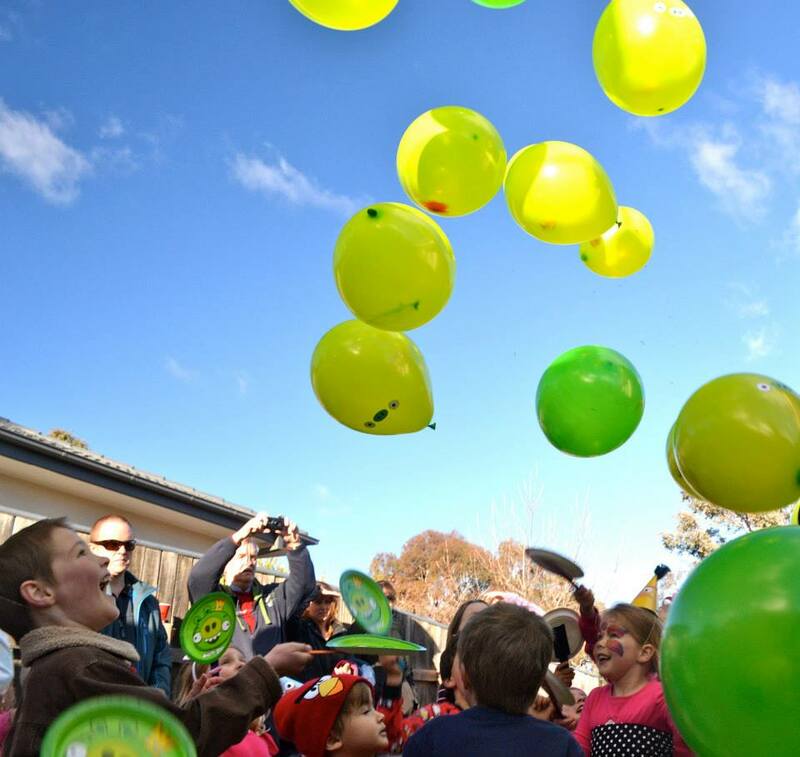 The kids also hit green balloons with printable pig face stickers on them that had party favours inside which looks like just too much fun to me! Overall the kids had a great time, and Jayne had fun putting together this popular party theme. She did a great job with decorations which she found as free Angry Birds printables online and used to create a blue background for the dessert table. The activities and food also created a great form of decoration for the party as well so she didn’t need to go too overboard creating the different lands found in the game so that was definitely a plus! If you’re keen to have a licenced birthday party, this would be a great way to keep decorational costs down. So there you have it, another beautiful party by Jayne Barton Overett. I know you’re keen to see more of Jayne’s wonderful parties so stay tuned for more on the blog later this month!